Who is supported by Cornerstone? Our Licensing Portal gives our clients a view into the progress in all three areas. Whether you are handling consumer and/or commercial accounts, Cornerstone Support can assist you in making sure that you are licensed where you need to be licensed. Most state statutes provide specific language regarding the licensing requirements and related exemptions for collection law firms. Please note that if you operate a law firm whose primary practice consists of collection activities, there are certain states that require you to be licensed. Although the Federal Trade Commission’s June 2, 2002 staff opinion letter regarding Section 803(6) of the Fair Debt Collection Practices Act is the most authoritative guidance with respect to the commission’s position on first party outsourcing, it has done little to clarify the various state positions on this matter. Whether you are handling consumer and/or commercial accounts, Cornerstone Support understands the state debt collection licensing requirements that impact you and can assist you in obtaining licenses where required. Whether you are collecting in-house or outsourcing the collections to a 3rd party collection agency, Cornerstone Support can assist you in obtaining licenses where required and provide your organization with the assurance that the agencies that represent you are appropriately licensed at all times. Are you concerned with the exposure related to unintentionally using an agency that is not appropriately licensed? 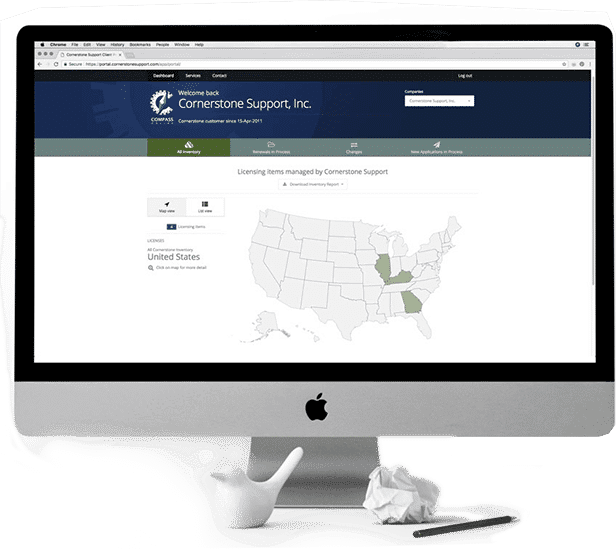 Cornerstone Support can provide your organization with the assurance that the agencies that represent you are appropriately licensed at all times.